The Portuguese Civil Aviation Authority (ANAC) issued its final decision on the proposal for Traffic and Regulated Handling charges at Lisbon Group airports, in the exact terms proposed by ANA Aeroportos on its deliberation issued on January 3rd, 2019. The amounts now approved by ANAC at Lisbon Group airports, for the year 2019, included in the attached table of regulated charges, will take effect on 07.03.19. ANA appreciates the participation of all Users and Representative Associations during the consultation process. The Portuguese Civil Aviation Authority (ANAC) issued its final decision on the proposal for Traffic and Regulated Handling charges at Porto and Faro airports, and for Passenger with Reduce mobility (PRM) at all ANA network airports, submitted by ANA Aeroportos de Portugal in November 2018. With this decision, ANAC approves the application of all charges in the exact terms proposed by ANA for 2018. The amounts now approved by ANAC at Porto and Faro airport, for the year 2019, included in the attached table of regulated charges, as well the amount of the PRM charge of 0.41€ per chargeable departing passenger, will take effect on 11.01.19. Regarding Security charge, ANAC maintains a favorable opinion of the value of 1.74€, per chargeable embarked passenger, proposed by ANA, thus awaiting the publication of the Decree Law. Within the Users consultation processes for 2019 charges, launched in September 2018 for traffic and handling regulated charges at Lisbon, Madeira, Açores airports and civil terminal of Beja, ANA hereby publishes the decision made on 03 January 2019 and the regulated charges tables for these airports. (This deliberation was made based on Decree-law 254/2012, 29.11.2012, with wording from Decree-law 108/2013, 31.07.2013). 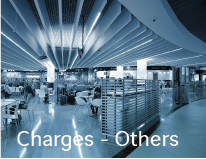 Within the Users consultation processes for 2019 charges, launched in September 2018 for traffic and handling regulated charges at Porto airport and Faro airports, and for security and PRM assistance charges at ANA´s airports network, ANA hereby publishes the decision made on 09 November 2019 and the regulated charges tables for Porto airport and Faro airports. (This deliberation was made based on Decree-law 254/2012, 29.11.2012, with wording from Decree-law 108/2013, 31.07.2013). As duly disclosed to the Users, the 2019 charges consultation for regulated traffic and ground handling activities to be applied at the airports of Lisbon Group (Lisbon, Ponta Delgada, Santa Maria, Horta, Flores, Madeira, Porto Santo Airports and Beja Civil Terminal) has been suspended as per ANAC’s decision. Taking in consideration the traffic estimation deviations, due to a stronger passenger increase than initially forecasted, ANA is going to apply an adjustment of regulated charges in November and December 2018, of 1,63% and 1,01%, respectively, for Lisbon and Porto airport. This charge adjustment, under de economic regulation model, will avoid the accumulation of deviations to future charges adjustments. Until the beginning of August, ANA will launch the consultation process to all Users for the 2019 charges. The present adjustment is specific and limited in time, having no impact in the charges to be proposed for 2019. (1) Report of the revenue from regulated charges and terminal passengers, recorded in 2017, in the airports of the ANA network. (2) Report from the auditors issued by Deloitte & Associados – Sociedade de Revisores Oficiais de Contas, SA. This information is in compliance with that established in the model of economic regulation, specifically in clause 10.1, of Annex 12, of the Concession Contracts for the airports of the ANA network, regarding the publication by the concessionaire of the annual audited financial operational information. In 2017, it was determined at Porto Airport a negative miscalculation adjustment, of -106.823€, according to the Report of the revenue from regulated charges and terminal passengers, published at ANA´s website. This adjustment means there is a difference on revenue charged (+0,1% Total of Regulated Revenue at Porto Airport in 2017), which will be returned to Clients by the end of June 2018, through a single payment proportional to the revenue from the regulated activities obtained in 2017 at Porto Airport, as it is established in line a) of the point 5.1 of Annex 12 of the Concession Contract. After a period of one year, from the date of publication of the return, ANA will report to ANAC the Clients who do not claim the credit, and the respective amounts. The Portuguese Civil Aviation Authority (ANAC) issued its final decision on the proposal for regulated airport charges for 2018, submitted by ANA Aeroportos de Portugal at the end of October 2017. The amounts now approved by ANAC for the year 2018, included in the attached table of regulated charges, will take effect on 01.01.18. Within the Users consultation process for 2018 charges, launched August 2017 for the Lisbon Group airports, Porto airport and Faro airport, ANA hereby publishes the decision made on 31 October 2017 and the regulated charges tables for Lisbon airport, Azores airports, Madeira airports, Beja civilian terminal, Porto airport and Faro airport. (This decision was made based on Decree-law 254/2012, 29.11.2012, with wording from Decree-law 108/2013, 31.07.2013). (1) Report on the revenue from regulated charges and terminal passengers, recorded in 2016, in the airports of the ANA network. (2) Report from the auditors issued by KPMG & Associados – Sociedade de Revisores Oficiais de Contas, SA. This information is in compliance with that established in the model of economic regulation, specifically in clause 10.1, of Annex 12, of the Concession Contracts for the airports of the ANA network, regarding the publication by the concessionaire of the annual audited financial operational information. Taking in consideration the revenue deviations due to the delay of charges entered into force in 2017 and the traffic estimation deviations, due to a stronger passenger increase, ANA is going to apply an adjustment of regulated charges from October (11th October) to December 2017, at Lisbon and Porto airports. By the end of July, ANA will launch the consultation process to all Users for the 2018 charges. The present adjustment is specific and limited in time having no impact in the charges to be proposed for 2018. On June 1st 2017 ANAC (Portuguese Civil Aviation Authority) issued its final decision on the proposal for regulated airport charges for 2017, submitted by ANA in November 2016. With this decision, ANAC approves the application of all charges in the exact terms proposed by ANA for 2017, with the exception of the charge for Passengers with Reduced Mobility (PRM), since the Regulator recommended to maintain its value the same as in 2016, ie € 0.40 per departing passenger. For this reason, ANA updated the passenger service charge, including the adjustment of the charge for PRM. The amounts now approved by the Regulator for the year 2017, included on the attached tables of regulated charges, will enter into force on June 11st, 2017. ANAC approved for 2017, in the exact terms proposed by ANA for all ANA network airports, the following regulated charges: landing, parking, hangar, aerodrome opening, regulated handling (passengers handling /check-in desks, baggage handling) as well as CUPPS (Common Use Processing Passenger System), CUSS (Common Use Self-Service) and BRS (Baggage Reconciliation System). The amounts now approved by the Regulator for the year 2017, included in the tables of regulated charges annexed, will take effect on 09.03.17. The Regulatory Authority is still analyzing the proposal to update the passenger service, passengers with reduced mobility and security charges. ANAC – Portuguese Civil Aviation Authority - has provisionally decided to withhold the approval of the Regulated charges structure as from January 1st 2017, set forth by ANA decision on 28 October 2016. Accordingly, and until ANAC issues the final decision on this matter, ANA will apply the approved regulated charges in force since January 2016 on all ANA airports. Within the Users consultation process for 2017 charges, launched August 2016 for the Lisbon Group airports, Porto airport and Faro airport, ANA hereby publishes the decision made on 28 October 2016 and the regulated charges tables for Lisbon airport, Azores airports, Madeira airports, Beja civilian terminal, Port airport and Faro airport. (This decision was made based on Decree-law 254/2012, 29.11.2012, with wording from Decree-law 108/2013, 31.07.2013). (1) Report on the revenue from regulated charges and terminal passengers, recorded in 2015, in the airports of the ANA network. (2) Report regarding the audit issued by KPMG & Associados – Sociedade de Revisores Oficiais de Contas, SA. Whereas the Government has not yet published the decree law that regulates the amount of the 2016 security charge at ANA airports, and whereas the Government requested on 30 December 2015 additional information from ANA, we hereby inform our clients that the existing security charge in force of €2.50 per departing passenger will continue to be applied at all ANA airports. According to the interim decision sent by ANAC (the Portuguese Civil Aviation Authority), the Regulated Charges presented on ANA’s decision published on the company’s website on October 30, 2015, enter into force on January 1st 2016. Please see information on folder “Regulated Charges Adjustment on November and December 2016 – At Lisbon and Porto Airports." Pursuant to the regulatory approval process of PMR charge, the Portuguese Civil Aviation Authority (ANAC), according to the Decree Law 254/2012, 28th November, approved the amount of 0,40€ per departing passenger. This PRM Charge update will be on force from 1st January 2016, and is applicable for Lisbon Group airports, Porto Airport and Faro Airport. This PRM charge update, now approved by the Regulatory Authority, is in line with ANA´s proposal, complemented with the Users’ opinions expressed during the consultation process. Within the Users consultation process for 2016 charges, launched August 2015 for the Lisbon Group airports, Porto airport and Faro airport, ANA hereby publishes the decision made on 30 October 2015 and the regulated charges tables for Lisbon airport, Azores airports, Madeira airports, Beja civilian terminal, Port airport and Faro airport. (This decision was made based on Decree-law 254/2012, 29.11.2012, with wording from Decree-law 108/2013, 31.07.2013). ANA decided to carry out an adjustment of regulated charges (traffic and regulated handling) at Lisbon Airport and at Porto Airport, with effect from 1st December 2015, promoting a partial recover of the deviation in revenue resulting from forecasting errors on the number of passengers served by Lisbon Group and Porto Airport, under the terms of n.5.2., Annex 12 of the Concession Contract. According to the decision sent by INAC (the Portuguese Civil Aviation Authority), the Regulated Charges presented on ANA’s decision published on the company’s website on October 31st 2014 entered into force on January 1st 2015.